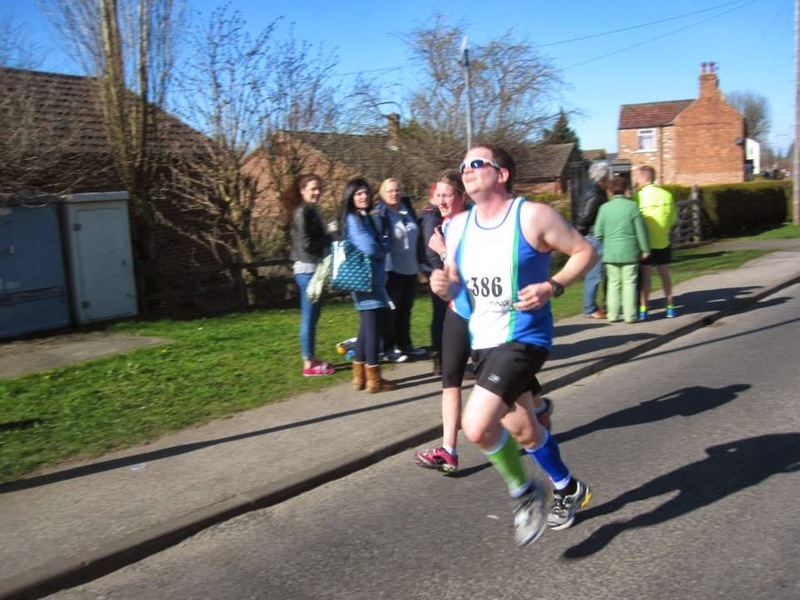 Well today I wanted to become a doubly "serious runner" at the Gainsborough 10km. I desperately wanted to complete a sub 50 minute 10km. This meant I needed to better my current PB by over 4 minutes and 39 seconds. Did I think it was achievable. You bet I did. Did it turn out to be achievable. There are many reasons for this but ultimately the fact I have barely run due to being injured for the last three weeks is to blame. If I had been running consistently I believe I would have sub 50'd. However I still PB'd over 10km which I am thrilled with. 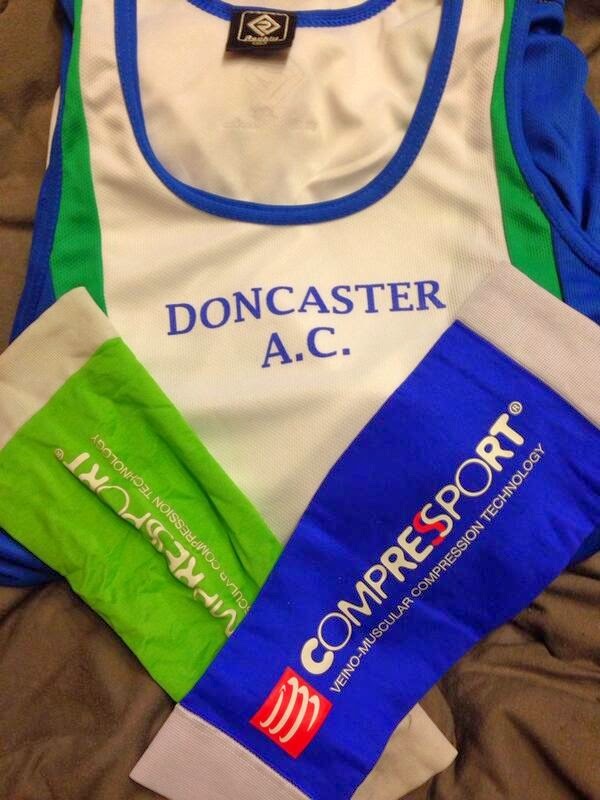 Today marked my first appearance in the club colours of Doncaster AC. Who'd have thunk it, me a member of a running club. I woke up this morning full of nervous energy about my first race of the year and proceeded to get dressed really early. 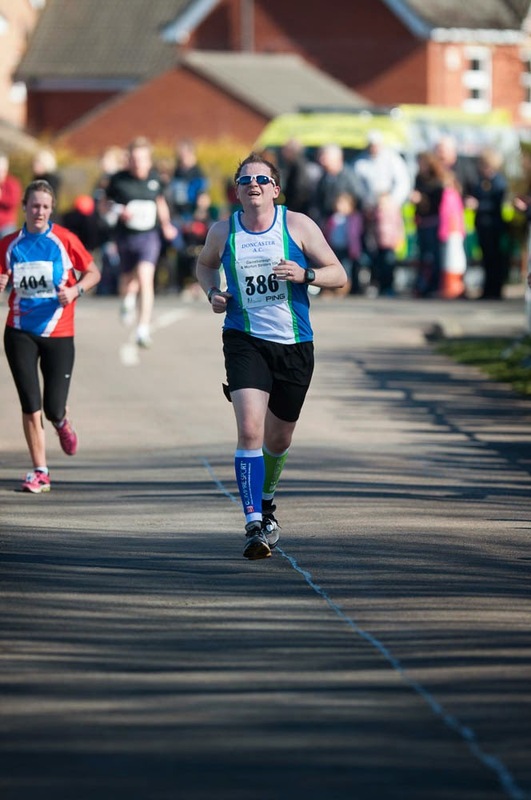 On Friday night I worked out that I owned calf guards in Doncaster AC club colours. It'd be rude not to wear them for the race wouldn't it? 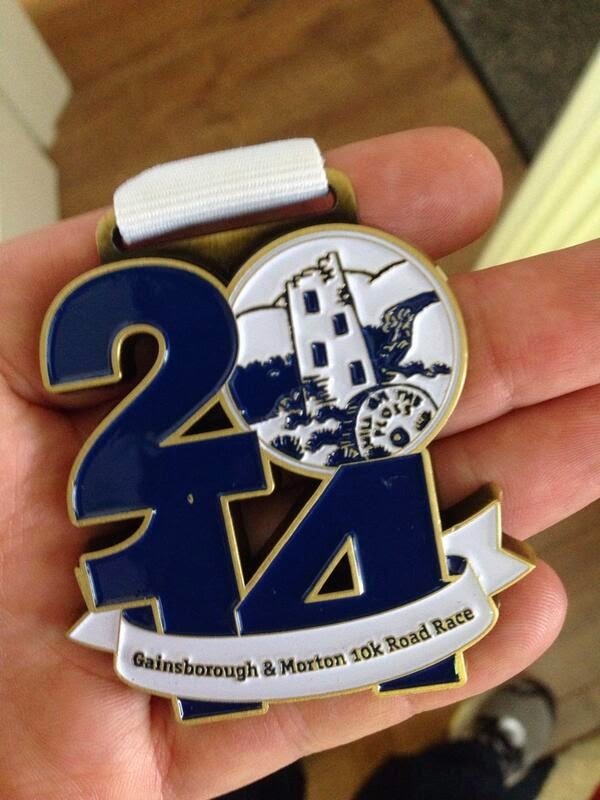 I drove over to Gainsborough with my Wife for company and made my way to the race area. I went for a quick warm up jog round the block to test my foot and was thankful that it felt okay. I made my way to the start area and placed myself about half way back. No point getting in the way of faster people. The hooter went and were underway. 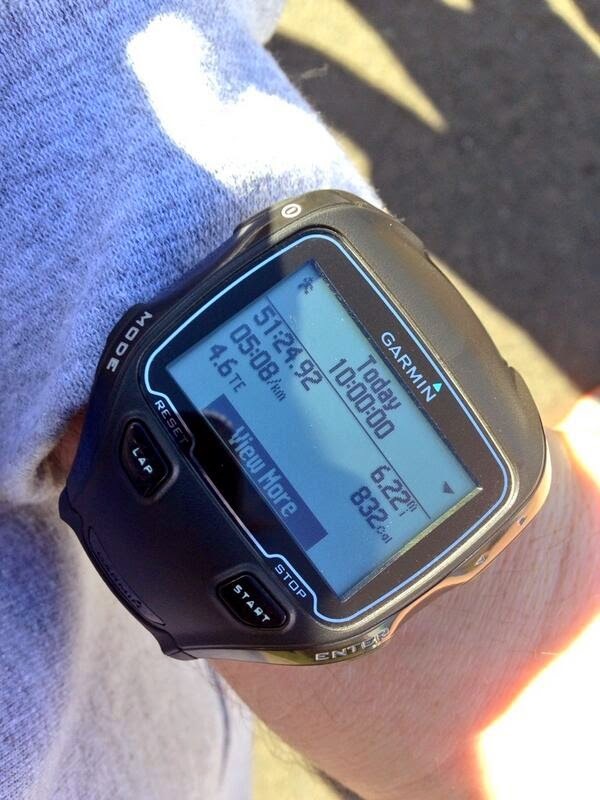 My aim was to run the entire 10km in my tempo zone. This meant my HR needed to be between 168 and 186 bpm. I was amazed that the first mile flew by in a time of 7:35. I just hoped I hadn't overcooked it. I do have a tendency of going off too hard when running. After the first mile the headwind picked up and it was energy draining. I felt like I really struggled between 2 and 6km with the wind. As I reached 5km I felt exhausted and collected a drink of water. My time for the first 5km was 25:18. I was pleased with this as it was very nearly on pace but I knew the wind had drained my energy reserves. I made an effort to check my HR every couple of minutes to ensure it was still in the correct zone. Most of the times I checked it was but occasionally it was too low and I then upped my effort to recover to the correct zone. The 6th km took me a lot longer than I had hoped. It took me well over 5 minutes and because of this, I knew my hopes of sub 50 had disappeared with the wind. Instead I went to plan B and ensured my HR was in the right zone and just aimed for a PB. With each passing km my dream of going sub 50 was slipping further and further away. Each km was taking me about 5:20 in the second half of the race and I was in a whole world of pain by this point. I was over the moon to see the 9km mark and knew I had only had about 5 minutes of pain left. I decided to give it my all in the last km. There was some encouragement from friends and club mates during this last km and it was much appreciated. There were even some photos and from these you can see how hard I was working. I was well and truly "in the zone" and had no real recollection of who was shouting to me. I passed through the finishing gate in a time of 51:24 according to my Garmin and was pleased with this as it meant I had PB'd by over 3 minutes which isn't to be sniffed at. 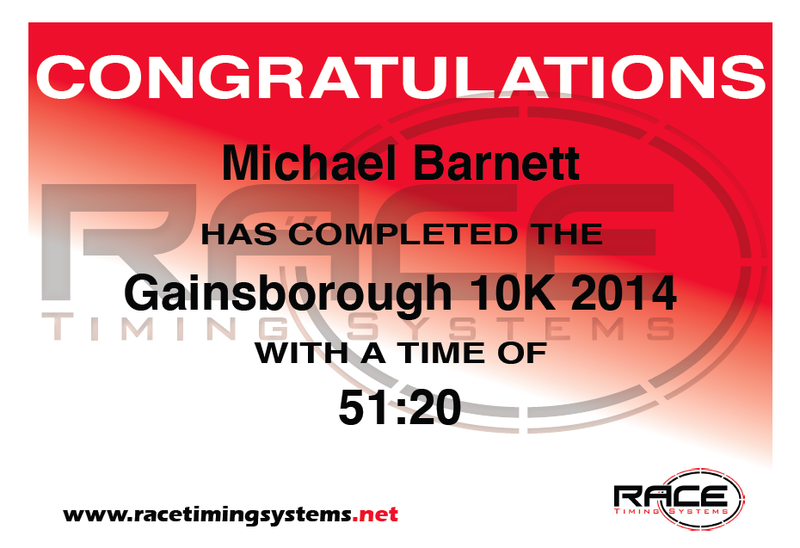 It transpires that the scale of my PB was 3:19 as my official time for the 10km was 51:20. Woohoo #PBKlaxon needed. To be honest with this only being my second road running race I didn't know how hard to push through the entire 10km as it was a gamble. If I went too hard I would blow up before the finish. If I didn't go hard enough I would feel I could have achieved more. I think I judged it just right as I don't feel I had much left in the tank at the end. The fact I nearly fell over after the finish proves this. I think the wind played a part in me not going sub 50 but most importantly my injury over the past three weeks played the biggest part in me not achieving my goal. There is always the next race. The goodie bad from the race was really good. And the best part. There was a #shiney and we all know how much I love #shinies. I would like to thank David Tune and Jenny Blizard of Blizard Physio for ensuring I was able to compete in todays race as it really was touch and go earlier in the week.